Here is a shocking report about the damn Canadian gold pits in northern Nevada and movement of neurotoxic mercury toward and into Idaho. RENO, Nev. – Startlingly high concentrations of mercury in ambient air were found near at least three northern Nevada mines, according to a January study by researchers at the University of Nevada, Reno. All three mines are west and upwind of Salmon Falls Creek Reservoir, where the Idaho Department of Environmental Quality has found elevated concentrations of mercury in the water. Read the rest in the Magic Valley Times News. By Matt Christensen. A pit of death? 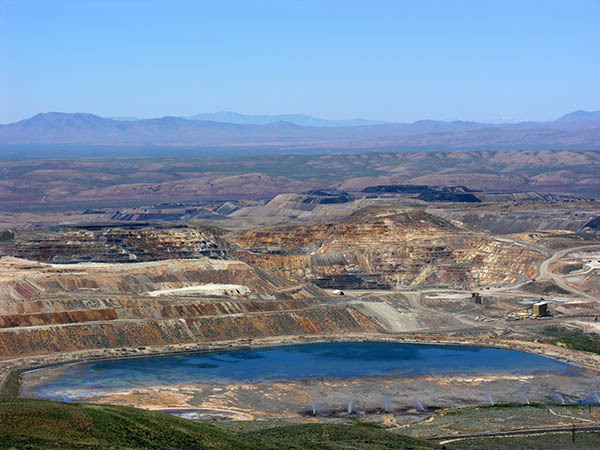 The open pits, spoils, tailings and associated carnage of the landscape from Barrick Goldstrike Mines spreads over miles of northern Nevada. New University Research Reveals Startlingly High Mercury Concentrations Near Northern Nevada Gold Mines. By Earthworks. The average mine releases as much mercury as 18 coal-fired electrical generating stations. Ever since we first began hearing about the massive mercury pollution a couple of years ago, I have – and this in all seriousness – been wondering if such exposure has not been affecting the mental processes of some of the wacked out Sagebrush Rebel, Hate the Federal Government Elko locals – like the idiocy of the Jarbidge Shovel Brigade and its RS 2477 showboating. Of course, a big part of that was just a distraction, like wolves, to focus all everybody’s attention on another issue. In that case the issue was: Bashing the federal government for daring to close a dead end road to an outhouse, thus tying the Forest Service and federal agencies into a near -paralysis of dealing with that gang of yahoos. The whole Shovel Brigade nonsense was partially a distraction, that gave the foreign-owned gold mines, many of them who also hold public lands grazing permits on huge allotments, more of an opportunity to operate under the radar and gash more pits, de-water more springs (as the pits go deeper, springs in the aquifer go dry as a giant cone of depression is formed), and spew more loosely regulated mercury pollution that blows north and east, and that is now in Idaho and Utah water – and likely beyond, too. It would be interesting to look at goings-on in northern Nevada in the past decade through this lens. KT, thanks for this appalling information. As one sitting downwind of these mines, I am highly pissed off. My entire family, including my young grandchildren, are all being exposed to these toxins. Early in 2000, Darlies Carter of Martin, County, Kentucky was driving home from work along the Huntley-Brinkley Road near her mountain home. Coal trucks hauling coal from nearby strip mines to be processed elsewhere frequently use the road. The weight limit for the road is 44,000 pounds (about 22 tons). Carter never made it home. Matthew Casey, driving a coal truck, hit and killed her. Casey is a repeat felon. He had taken 30 Xanx, cocaine, and marijuana, and had been driving his overloading coal truck for 18 straight hours before plowing head-on into her. “I was getting ready for a graduation, and instead had to go to a funeral,” said her mother, Patsy Carter. Casey’s truck had been 50 tons over the legal weight limit – something that he testified that his employer, Massey Energy, knew. Matthew Casey spent only one year in jail. During this year, Pasty Carter’s 18-year-old nephew was hit and killed by an overloaded coal truck while driving home from school. A year later, his mom April died at age 47. Jr Ranger: It would be interesting to see who Massey Energy gives political contributions to. Also notice the casinos are GREAT BIG contributors. If you go back to Open Secrets home, you can then find contributions 2001-2006. [Can only do one link in a Post]. In the 2001-2006 Open Secrets Reid contributions, notice that Barrick is gone, but Newmont remains. The casinos remain BIG donors – but now there are all kinds of names that look like lobby firms that it would be very interesting to know just WHO the $$$ were coming from. I do recognize Greenberg Traurig, where Jack Abramoff had worked as a lobbyist until things sort of, shall we say, got a tad dicey. Now think: What do those great big glittery casinos and their Las Vegas home need? They need water and cheap power (gold mines also need a lot of power to roast the gold to release the mercury into the air). Think what Harry Reid’s BIG public lands dealings were in the past 4 or 5 years. A series of 3 quid pro quo wilderness and development bills that are selling off large blocks of BLM land for development. The Lincoln County Bill mandated water pipeline corridors to extend north into Lincoln and White Pine Counties to tap the aquifer in the heart of the Great Basin to export water to Las Vegas (essentially to mine fossil ground water). Then in a late 2006 legislative Rider, the Reid and Ensign’s White Pine Bill authorized MORE selling-off of BLM land in White Pine County – to facilitate industrial development and giant powerline corridors to extend SWIP and other powerlines across many hundreds of miles of public lands, AND to build a series of mercury-spewing coal-fired power plants near Ely – which will also involve MORE mining of fossil ground water for the power plants … (Ralph had a Post a week or 2 ago about THIS, too). I believe when the events of the past 10 or so years in Nevada are looked back on, and the environmental consequences are fully exposed – the politicians that enabled this large-scale destruction of public lands for the gold mines and big casino donors, are going to be remembered as destroyers of the Great Basin. No amount of wilderness penance is going to absolve Reid of this. Then you’ve a hunch what the music meant…hunger and might and the stars”. If i were to take a trip from kansas city to las vegas with a camper would i have to go through this mountain range to get there??? how far through is this mountain range?? ?